ATHENS, Ga. — At the Tate Center today, students and members of the NAACP discussed campus opinion on the N-word. 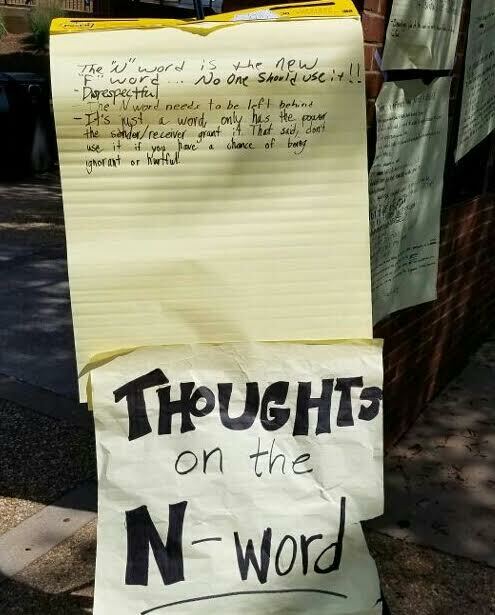 A poster was put up with “Thoughts on the N-Word” in big bold letters. Above were hand written student opinions on a large notepad. The conversation is spurred today as a lead-in to a visit from Neal Lester this Saturday, September 17. Lester is the founding director of Project Humanities at Arizona State University. But he has returned to his native northeast Georgia to spark and continue conversation surrounding the N-word at UGA. Lester will speak on Saturday, September 17 at 4 pm at the UGA Chapel. Live hip hop performances, voter registration booths and N-Word discussion pages will continue at Tate on Thursday, September 15 from 11:15am to 2:00pm.